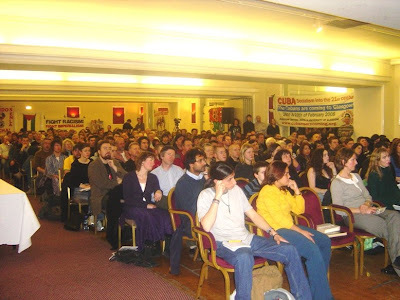 Over 350 Glaswegians cheered when Orlando Borrego declared that this was the largest audience so far in the Cuba: Socialism into the 21st Century speaking tour organised by Rock around the Blockade. The meeting began at 7:30pm on Thursday 28 February and by 10pm most of the audience remained listening intently as Borrego and the other Cuban speaker Jesus Garcia answered their questions, which ranged from agricultural organisation to freedom of expression for artists and the relationship between Cuba and Venezuela . The meeting began with the RATB speaker Hannah Caller, who outlined the need to build solidarity with Cuba here in Glasgow . Outlining the privatisation of the health and education systems, the growing prison population, attacks on immigrants, increasing inequality and poverty in Britain , she pointed out the link between defending our own rights and defending the gains of the socialist revolution in Cuba. Jesus Garcia pointed out how the word ‘democracy’ has been abused and manipulated by the political enemies of the world’s poor and oppressed and said he would describe Cuba’s participatory and representative electoral system so that the audience could judge it for themselves. 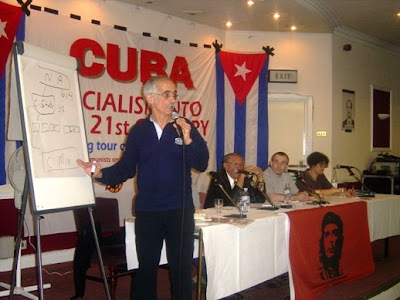 Reading from this week’s issue of Socialist Worker, newspaper of the Socialist Workers’ Party, he exposed how they had distorted the truth about the Cuban power structure in claiming that it was a top down system. If this is the case, explained Jesus, it should be understood that at the top of the hierarchy in Cuba is the Cuban people – the entire population. He went on to explain how they directly elect representatives from their communities and the organisations of the masses. There are 2,000 social groups in Cuba – despite the claims of the Revolution’s enemies who claim there is no ‘civil society’. 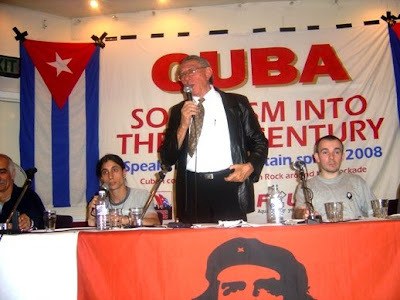 Borrego spoke about the need to build political consciousness in the struggle for socialism – and pointed out the role of Rock around the Blockade in this ideological battle for a better future for humanity. He ridiculed a comment often heard about Cuba ; that the people don’t have enough food and pointed out that this is part of a conscious campaign to undermine the Cuban Revolution. At the end of the event, it was clear it had had a profound impact on the audience; one woman said it was the most inspirational meeting she had ever attended. Dozens of people joined the campaign Rock around the Blockade, committing to building a Scottish socialist movement in solidarity with Cuba . As soon as the meeting finished a Glasgow Irish folk group struck up with songs of international resistance and people stayed enjoying themselves, and continuing informal discussions until 1am.